Tampa - After 20 years in space, NASA's famed Cassini spacecraft made its final death plunge into Saturn on Friday, ending a storied mission that scientists say taught us nearly everything we know about Saturn today and transformed the way we think about life elsewhere in the solar system. Cassini, an international project that cost $3.9 billion and included scientists from 27 nations, disintegrated as it dove into Saturn's atmosphere at a speed of 75,000 miles (120,700 kilometers) per hour. "The signal from the spacecraft is gone," said Cassini program manager Earl Maize of NASA's Jet Propulsion Laboratory. "I hope you are all as deeply proud of this amazing accomplishment," he told colleagues at mission control. "This has been an incredible mission, an incredible spacecraft and you are all an incredible team." Cassini's final contact with Earth came at 7:55 am EDT (1155 GMT). Its final descent into Saturn's atmosphere began about an hour and a half earlier, but the signal took that long to reach Earth because of the vast distance. Cassini's plunge into the ringed gas giant -- the furthest planet visible from Earth with the naked eye -- came after the spacecraft ran out of rocket fuel after a journey of some 4.9 billion miles (7.9 billion kilometers). Its well-planned demise was a way to prevent any damage to Saturn's ocean-bearing moons Titan and Enceladus, which scientists want to keep pristine for future exploration because they may contain some form of life. "There are international treaties that require that we can't just leave a derelict spacecraft in orbit around a planet like Saturn, which has prebiotic moons," said Maize. Three other spacecraft have flown by Saturn -- Pioneer 11 in 1979, followed by Voyager 1 and 2 in the 1980s. But none have studied Saturn in such detail as Cassini, named after the French-Italian astronomer Giovanni Domenico Cassini, who discovered in the 17th century that Saturn had several moons and a gap between its rings. The 22 by 13 foot (6.7 by 4 meter) spacecraft is also credited with discovering icy geysers erupting from Saturn's moon Enceladus, and eerie hydrocarbon lakes made of ethane and methane on Saturn's largest moon, Titan. 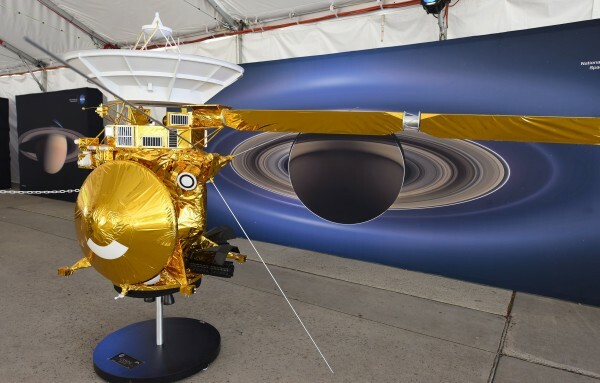 Linda Spilker, Cassini project scientist, likened Cassini's mission to a marathon. "For 13 years we have been running a marathon of scientific discovery, and we are on the last lap," she said early Friday. Eight of the spacecraft 12 scientific instruments were on, capturing data, in Cassini's last moments, before it disintegrates like a meteor, she said. "We are flying more deeply into Saturn than we have ever flown before," she said. "Who knows how many PhD theses might be in just those final seconds of data?" Already, some 4,000 scientific papers have been based on data from the mission, said Mathew Owens, professor of space physics at the University of Reading.